It’s no secret that the conventional workplace has been known to inhibit creativity, rather than support it. So, employers increasingly are investing time and money into the services of design professionals to help them create spaces that nurture ideas, foster creativity, and inspire innovation. Especially in today’s economic climate, innovation and speed-to-market are key factors in the success of a company. And if a workplace boasts a more unified and collaborative environment, it’s more likely to fosters the fresh, innovative ideas necessary to propel a company past its competition. 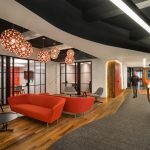 In 2010, Primatics Financial hired INTEC Group, Inc., to further develop this collaborative concept and create a unique, motivational space for its employees. The Primatics corporate philosophy of “Think Big” served as their conceptual inspiration. So the INTEC designers sought to transform a second-generation office space into one that would give Primatics an advantage over others in their industry. The Primatics executive team envisioned a space that was architecturally inviting to attract the best and brightest candidates to join their staff. However, monetary constraints limited them to what they could accomplish within the tenant improvement allowance. Additionally, Primatics emphasized a personal obligation to limit environmental impact and reuse much of the space formerly occupied by a conservative, residential real estate developer. Not only would this help minimize the budget over the course of the project, it would also be as “green” as possible. The INTEC team decided to remove all unnecessary walls and eliminate the need for private offices, even for management and those associated with the executive team. Ãƒâ€š A floor-to-ceiling glass wall system was used to section off the conference room, the pantry, and reception area; these were the only areas associated with the 22,000 SF renovation that needed to maintain a certain level of privacy and noise control. INTEC then selected the Hum workstation by Kimball Office so employees could work alone when necessary or collaborate within groups. The screen wall between workstations prevents neighborly distraction while maintaining an overall level of openness. With walls removed, the space was bathed in natural light and all employees were given exposed views to the outside. The INTEC design team then selected two types of carpet: a darker carpet for the internal space and a lighter carpet that would be run 8’ out from the perimeter with the purpose of reflecting light into the space, making it appear brighter. Light levels in the workplace are often associated with productivity and increased morale so even the minor details associated with the design were deliberate and an integral part of the overall goal to improve employee satisfaction and performance. The spacious, collaborative work space presented an acoustical challenge that required careful thought and planning amongst the INTEC design staff. The result was a state-of-the art sound control solution conducive to this type of interactive office environment. 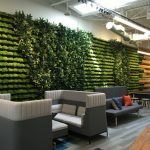 The results are displayed as accent walls throughout the open work areas and are not only functional, but add another layer of dimension and visual appeal; large sound panels wrapped in recyclable fabrics and printed with marketing graphics in eco-responsible, low-impactÃƒâ€š recycled ink. The integrated color scheme features a blend of corporate colors and vibrant, trendy colors also associated with stimulating creativity. INTEC delivered the project to Primatics on time and under budget and the results were enthusiastically welcomed. In the time since renovation, Primatics was named one of the fastest-growing companies in North America; an accurate testimony supporting the fact that the concept of the collaborative work environment truly is successful, producing innovative results for both the designers and their clients. Architect & Design: INTEC Group, Inc. Previous articleBehind the Curtain: NeoSystems Corp.